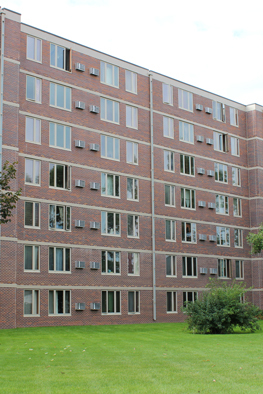 The Worthington HRA owns and manages approximately 136 Units of Public Housing and 64 Units of Market Rate Housing in the City of Worthington. These units include one, two, three, and four bedroom apartments, houses, and duplexes. The sites include the Atrium Hi-Rise, Lucy Square Townhomes, and various scattered houses and duplexes located throughout Worthington. The Market Rate Housing Sites include: "Prairie Acres" and "Rising Sun Estates"
The Worthington HRA is authorized up to 269 Housing Choice Vouchers. Eligible families find their own rental unit within the seven county area served by the Worthington HRA. The counties include: Cottonwood, Jackson, Lincoln, Lyon, Murray, Nobles, and Redwood. The Worthington HRA is authorized up to 269 Housing Choice Vouchers. Eligible families find their own rental unit within the seven-county area served by the Worthington HRA. Market Rate housing application. A $25 Application fee is required for Rising Sun Estates & Prairie Acres. Download or fill out Online Application. Public housing application. Download or fill out Online Application. Please visit hud.gov to get more info on HUD's Public Housing Program. Section 8 housing application. Download. Please visit hud.gov to get more info on HUD's Housing Choice Voucher/section 8 Program.